My writing project has finally been completed (and on deadline! 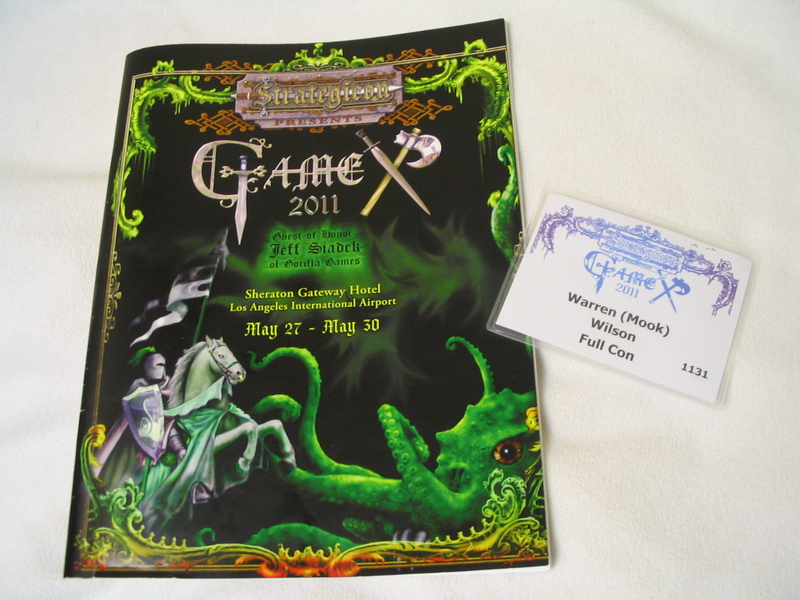 ), so I have time to write up an overview of the recent Gamex game convention. As a warning – it’s long. I haven’t been to a gaming convention in probably 15+ years, and Gamex didn’t disappoint. I had a great time! The people were fun and friendly, the games were varied and well-run, and the hotel room was quiet and comfy. It was an awesome little vacation. I got there Friday evening and came home really, really late on Sunday. In those 2.5 days I played 7 different games, each 4 hours long, for a grand total of 28 hours of gaming. The hotel had more than enough room, and seemed happy to have us – they certainly treated me well. 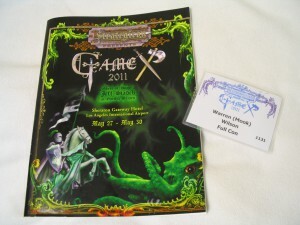 I had preregistered for the convention online, so all I needed to do was pick up my guest badge. The only difference I noticed between this and the conventions I went to in New England was pricing structure – in New England there was an admission fee (usually about $25-$30), then an additional fee per game slot (usually $2); Strategicon has just one cost for general admission (depending on how many days you register for), then you can play in as many game slots as you can cram in without further cost. So I just finished watching a movie that actually made me angry it was so bad: Blindness. It’s about what happens when a large city is suddenly affected by a mass outbreak of blindness, specifically the circumstances surrounding a woman mysteriously immune to the disease and her husband in one of the quarantine centers. Those of you familiar with my wide-ranging, eclectic, omnivorous taste in movies may be surprised to find that there are, in fact, movies I don’t like. It’s rare, but it does happen. My main complaint about this movie is its complete lack of realism. Don’t get me wrong, I’m all for fantasy, science fiction, sentient grapefruits, whatever – but not in a movie that is supposed to take place in our real, contemporary world. If it’s a movie that supposed to take place in “the real world”, then the people better behave like real people or the whole thing just becomes an exercise in stupidity. To avoid spoiling plot points, I won’t list some of the more annoying examples until the end of the post (after the “Read on …” break). For now, suffice to say – many of the reactions of both individuals and the government / military are just stupid, and ridiculously contrived to fit the plot rather than to make any sense. That right there was enough to destroy the entire film for me. I barely cared about any of the characters because they didn’t register as ‘real’ people, just actors going through their badly-written motions. The reason this made me angry is because the premise of the film is awesome, could have really explored some interesting, thought provoking stuff. Instead it used that premise to shoehorn in nonsensical scenes and belabor obvious points. Giving this one a score of 4 out of 10. It would have been lower, but there were glimpses here and there of much better material hidden beneath the tripe.